We first took a look at social network, CircleMe in October when it launched in private beta. The site makes it easy to create an online profile for yourself, showcasing ‘all of your favourite things’ – sites, movies, books, music, hobbies – whatever you can think of. At the heart of it, CircleMe is really all about connecting with people who have the same interests as you. Adding other users to your network allows you to keep up with all of their interests, making the site a great way to discover new recommendations and meet like-minded people. Since we first reviewed the site, founder Erik Lumer and his team have been hard at work adding new features, including universal commenting, an activity feed, rich media integration, a bookmarklet and more. Today, CircleMe opens its doors to the public, and with that also comes a brand new iPhone app. The app gives users access to all of CircleMe’s main features – you can search for items and ‘like them’, keep up with your activity feed, check out other users’ profiles, explore the public feed, etc. 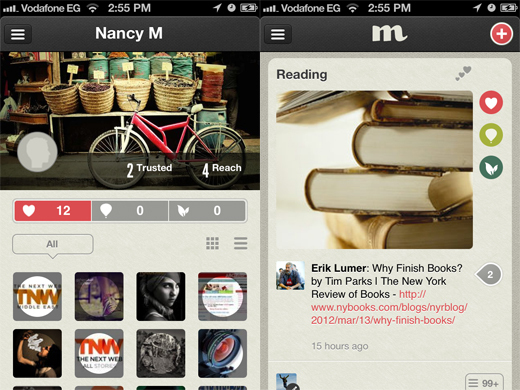 CircleMe offers everything you would expect of an iOS app – a beautiful UI and one that stands out from the crowd. It appears to be following Path’s lead when it comes to using a different approach in its interface. To post a new update using the app, just hit the little red ‘plus’ button in the top right hand corner, and a small menu will roll out. The app is already off to a really strong start but Erik tells us that a lot of updates and improvements are expected in the coming weeks. CircleMe’s iPhone users will also be able to take advantage of one additional and significant feature that isn’t found in the Web experience – planting items around town. So what does that mean? Search for an item on CircleMe or even select a song from your music library, and then virtually ‘plant’ it to be found by other users. You can explore items that have been publicly planted near you – anywhere from 100m to 10km – and will receive notifications when someone from your contact list has planted something in your vicinity. Integrating location awareness into the app takes CircleMe far beyond just a way to keep up with activity on the site when you’re on the go. Speaking about the feature, CircleMe CEO Giu D’Antonio says, “The use cases for plants are virtually infinite: recommending a good book at the bookstore or an ongoing exhibit in a museum, highlighting a place where a famous person used to live, leaving surprises to friends like a song that they can immediately listen to when stumbling upon the plant, and so on”. He adds, “Such planting behaviour could become a game changer on how the physical and digital worlds get coupled to foster serendipitous discoveries”. We wouldn’t be surprised to see CircleMe users get really creative with their geocaching adventures. The feature has surprise marriage proposal written all over it. And if Google Maps is good enough for a marriage proposal, we certainly think this is too. CircleMe itself has already come up with a great use for the feature, which it will be implementing in San Francisco and London. Starting from March 16, CircleMe will running a week long scavenger hunt. With some pretty impressive prizes on the line – iPads and Apple TVs – secret items will be planted close to landmarks in both San Francisco and London. If you live in either city, all you have to do is figure out where they’ve been planted using the app. What do you think of CircleMe? Let us know in the comments.